Please Don't Feed Steven Zytveld, originally uploaded by johnwmacdonald. 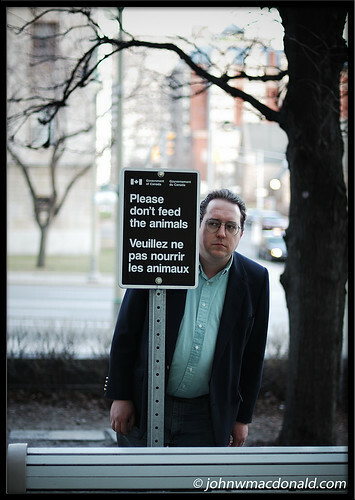 "Please Don't Feed the Animals"
though I can not confirm positively Steve *actually* eats food per se. Steven actually begged me to take this photo...just in case anyone was thinking I was making fun of him. Steve's a saint. "Beg" is a strong word, but I've been eyeing this sign for the past couple years, thinking it's way funnier than it looks. Thanks again, John, for feeding my weirdness and whimsy! P.S. What happened to the other shots? Were any of them any good?